Nature prefers curves. Man prefers straight edges and square corners. Curiously, both preferences arise from the same requirement: ease of construction. The difference lies in the methods of construction. Nature uses growth and erosion. Man uses cutting, moulding and joining. Growth and erosion occur on all sides of a natural object and therefore inevitably produce rounded shapes. 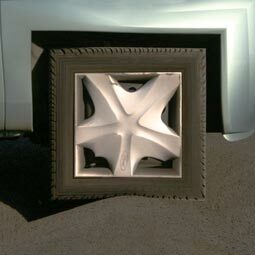 Man-made objects require flat surfaces and angular corners in order to join sub-components. Cutting produces flat surfaces which are also the easiest to join with a strong bond. Even where man emulates the attractiveness of nature's curves, such as in the design of modern motor cars, there are still many straight lines, notably around openings and joints. The problem of squaring the circle was probably posed before recorded history, as a need arising from construction projects. The question is whether it is possible to construct, purely by drawing with ruler and compasses, in a finite number of steps, a square having the same area as a given circle. On the face of it this does not seem difficult. However it has been proved (Lindemann, 1882) to be impossible. Mathematically the reason is that pi, the ratio of the perimeter of a circle to its diameter, is a transcendental number. This means not only that pi cannot be expressed exactly as the ratio of two whole numbers but also that it cannot be expressed as an algebraic equation. Pi is involved in the circle squaring problem because the area of a circle is equal to pi multiplied by the square of its radius. Much more about this can be found in the book "The Joy of Pi", by David Blatner, Penguin Books, London, 1997 (or, in USA, Walker and Company, 1997).